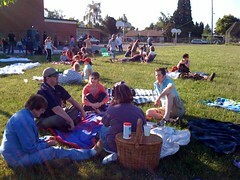 On Friday the Lewis Elementary PTA sponsored a BBQ and picnic on the school playground. Musical entertainment was provided by our own Boomin' Beats students and also a local Marimba Band which featured Lewis alum, Wilson Alness. In addition a local band lead by Lewis parent Chris Hawking also performed to a very appreciative crowd. It was a great event on a perfect spring evening and we had a great turnout.